Traditionally built Mongolian yurt with log burner and complimentary basket of logs on arrival! Sleeps up to 6. Brother to Gertie! 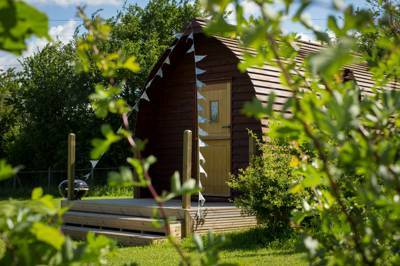 It took over two years for local craftsmen to design and build the perfect pods for Buxhall Country Glamping. It’s a sign of just what a labour of love this rural glampsite is. Secluded away on the edge of Buxhall village it’s been built with modern comforts in mind, with the likes of air-conditioning and a mini-kitchen in each pod, yet the place also has a real sympathy with its surroundings. The brown shell of the pod has an earthy camouflage against the backdrop of the hedge-lined meadow and circular windows constantly peep out at the trees and birds. It’s a perfect marriage of comfort and proper, outdoor living. 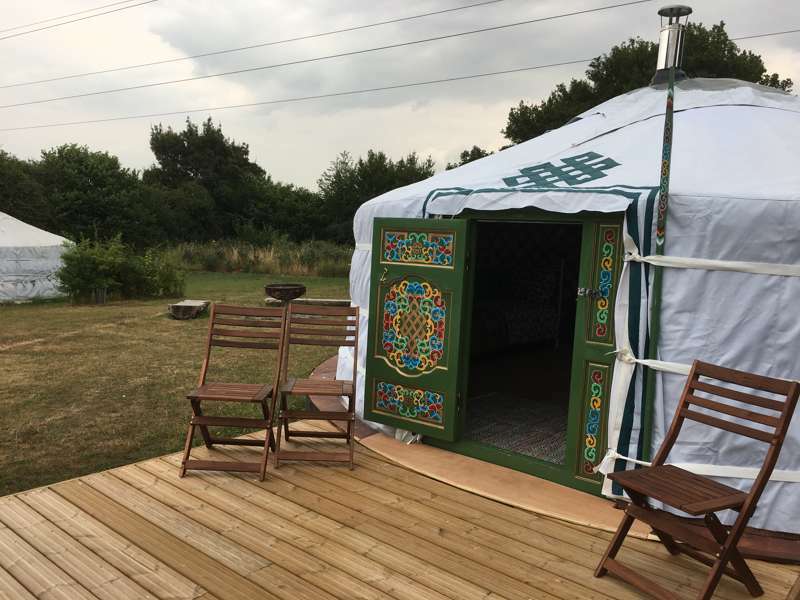 Run by amiable owners Val and Graham, the meadow hosts just two pods and a brand new yurt, each with their own private bathroom just a short stroll away. Every unit has a king-sized bed, with the added option of single beds and fold out mattresses that help boost the numbers (up to six people can sleep comfortably in the yurt, four in the pods), while the broad space of the meadow that stretches out before them is ideal for children to fling a Frisbee around or hunt for bugs in the newly planted hedgerows. The smaller scale of the glamping site allows Val and Graham to give that extra attention to detail. 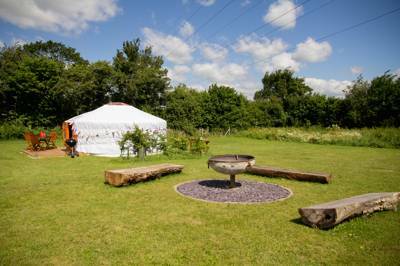 Fresh towels are provided; tea, coffee and essential items are stocked in your kitchen; and a complimentary bag of logs is provided for the yurt’s wood-burning stove. They’re also happy to give local recommendations as they greet you and show you to your abode, from walks to the village pub and beyond, to the best places to go on the Suffolk coast. It’s a 45-minute drive to the nearest beach, though there’s plenty to stop you along the way, with the local town of Stowmarket a happy diversion, particularly on market days (Thursdays and Saturdays). Historic Bury St Edmunds, meanwhile, is well worth a wander, with independent shops and cafés galore. The very best way to make the most of the place as a family, though, is to bring bikes, both for the local cycle route (National Route 51) that runs just north of the glamping site, as well as for the family-friendly trails in Thetford Forest. There are handy bike-racks provided in the meadow on your return. You see… everything has been thought of. 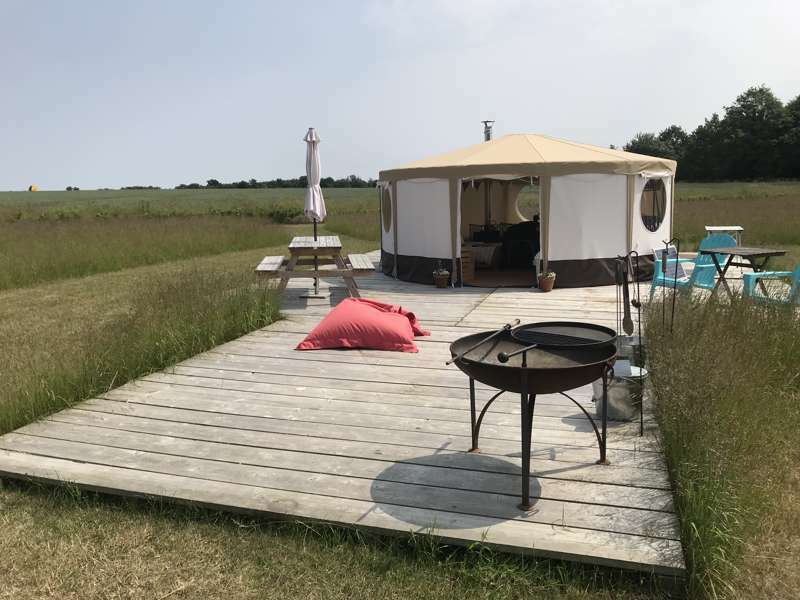 Glamping is the fun way to have a back-to-nature experience combining camping with a touch of luxury, without the hard work of pitching a tent or lugging your own kitchen sink or sleeping bag with you. It's camping in style - home comforts included! 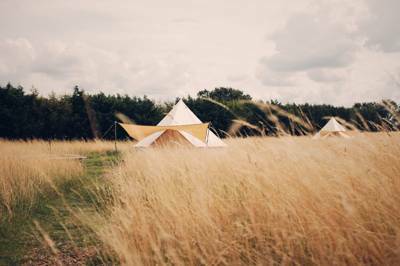 Our site is in a peaceful meadow in the middle of the lovely Suffolk countryside, well away from the road so the children can play in safety and you can relax. Historical buildings are nearby to explore and well preserved medieval architecture as well as some of the prettiest villages with their chocolate-box thatched roof cottages. 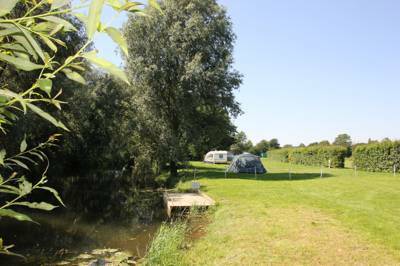 For latest availability and best prices for Buxhall Country Glamping , please use the Date Search above. Had a lovely 2 night stay with kids and dogs and had a really nice welcome from Val. clean and cosy pod, very clean private bathroom and toilet in the "Pee Pod" which was great. lovely quiet location with BBQ and firepit and a welcome pack of marshmallows for toasting, which the kids loved. Would definitely recommend a stay here to get away from the rat race and unwind. Thanks a lot Val!! Thank you Danielle, we're delighted you enjoyed your stay with us. Hope to see you again. 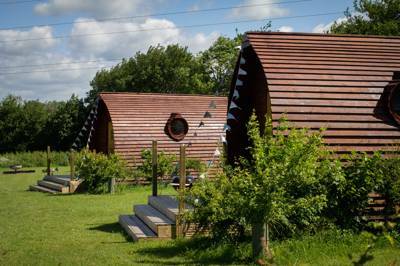 Stayed in a glamping pod at Buxhall and thoroughly enjoyed it. 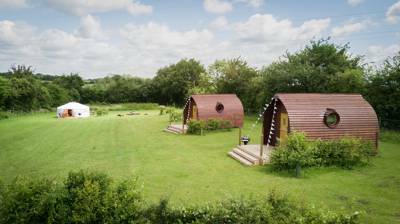 Graham and Val are very welcoming and the glamping site is quiet and relatively small. There were two other couples there when we stayed. We drove to the coast both days and really enjoyed exploring Suffolk. Facilities were excellent, beds were comfortable and toilets were top notch! Glamping only. Families, couples, groups of up to 14 people (including children; no stag or hen groups). Up to 2 small dogs allowed in pod 2. Pods sleep 4 in a kingsize bed (slides away for more room during the day), a small single bed and a floor mattress suitable for children only. They feature a mini kitchen with sink, running water, kettle, toaster, combi-microwave, full size fridge with icebox, crockery, plates, glasses and essential equipment. There's a folding table and chairs and an overhead heater/aircon. The yurt has all of the same facilities, but is heated by a wood-burning stove. It sleeps 6 in a double bed, 2 trundle singles that can be pushed together to create a king-sized bed if preferred, a third trundle bed and a floor mattress suitable for children. Bedding provided in all accommodation but only bedding for 4 people in the yurt. Charcoal BBQ and firelighters provided. Private, underfloor-heated bathroom with shower, loo and basin allocated to each unit just a few steps away at the top of the field. Disabled facilities if required. Free parking, bike racks, 4G signal. The lovely village of Buxhall may be small but its is a real hidden treasure. The local pub (see Food & Drink) is an old, atmospheric haunt with exposed beams, and the village even has its own windmill (though, sadly, it lost its sails during a storm in 1929). Local walks are easy, straight from the campsite, and National Cycle Route 51 is nearby and popular with families. Granary Crafts (01449 736363), a local history/bygones museum, is also within walking distance and open on weekends. The nearest town is Stowmarket (3 miles), which has a small market on Thursdays and Saturdays and is also home to the open-air Museum of East Anglian Life (01449 612229) hosting various events during summer. Historic Bury St Edmunds is also easily reached by car (20 mins) with the abbey ruins in the lovely Abbey Gardens, stunning cathedral, individual shops and a popular market on Wednesdays and Saturdays. It's a 45-minute drive to Southwold and the Suffolk coast. The Buxhall Crown (01449 736521) is just a few steps away and there's The Six Bells (01449 736268) in the neighbouring village of Felsham. For everything else, travel to Stowmarket, a reasonable sized town with restaurants, cafés and pubs. Alder Carr Farm (01449 720820; 15-minute drive) in Needham Market is a popular farm shop with a few individual shops and a café, while children love the farm trails at Hollow Trees Farm (01449 741247; 20-minute drive) in Semer, which also has a farm shop and café. From the north or Midlands use the A14 leaving at J47 and head to Woolpit. Drive through Woolpit, staying on this road for 4 miles. Turn right when you see the white sign for the Buxhall Crown (after the Onehouse village sign). Follow for ½ mile (past Granary Crafts) and turn right again. You'll come to the Crown on your left after ½ mile and Buxhall Country Glamping is 100m on your right. From the South or East leave the A14 at J50, following the signs to Stowmarket (A1120 then A1308). Follow signs to Combs Ford, then to Gt Finborough along Combs Lane (past local shops and surgery). Turn left at the end of Combs Lane, following the B1115 for 1 mile into Gt Finborough. Turn right opposite the primary school, signposted to Buxhall (and Rattlesden Airfield). Take the second left. 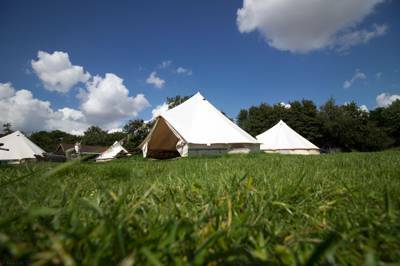 You'll come to the Crown on your left after ½ mile and Buxhall Country Glamping is 100m on your right. Stowmarket railway station (0845 748 4950) is around 10 minutes by car. There are regular trains to London Liverpool Street or Norwich and Peterborough if you're heading north. Taxis are available at the station or the campsite can arrange collection if advanced warning is given.